Just to show you that I am, in fact, human, let me share with you what I did Thursday morning. I don’t think I have ever done this before, so I’m a little ashamed, but hey, such is life. My alarm went off at the usual 4:30am. It took the usual 15 minutes to will myself out of bed, and I proceeded to get ready for the morning. This morning, my plan was go for a run in White Plains. I checked the weather (31degF, feels like 21 degF, not raining…not bad), got a little concerned over how loud the wind was blowing by my windows, and got dressed accordingly. All my bags were packed. All I had to do was put on my sneakers and I was ready to go. Except, my sneakers never got put on. Instead I milled around, decided to make a grocery list, tended to my runny nose, wondered why I was still cold even with two shirts on and ultimately made the decision to not leave. Instead I crawled back into bed (fully dressed in cold weather running attire) and just stayed there for 20 minutes. The odd part was, that 20 minutes plus a hot shower did me wonders. Wonders as in, made me feel functional again. I felt better and my runny nose was gone! After 6 years of early morning runs/workouts and wishing I could crawl back into bed every single time, I finally did. I am no longer Superwoman. This just means I need a super salad. 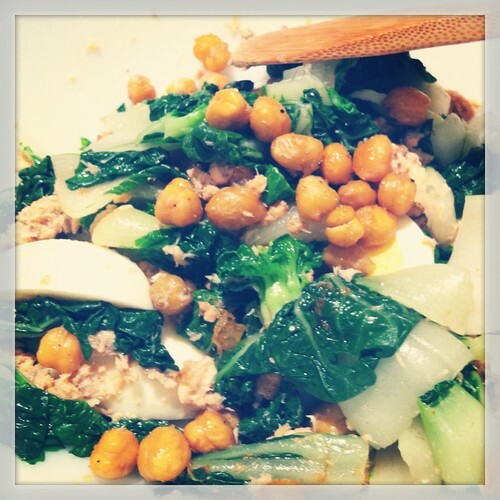 My friend Liz sent me this recipe for Bok Choy Brown Rice Salad by Annie’s Eats. 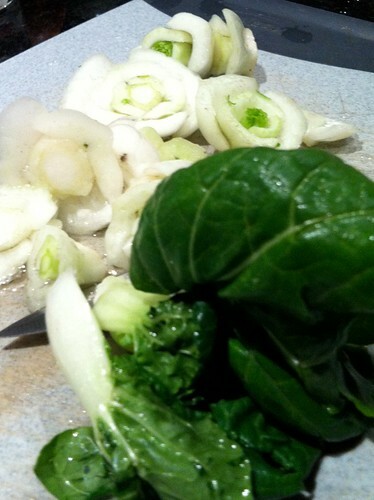 I thought it was brilliant to use Bok Choi as the greens of a salad. Except, I don’t think I’d eat it raw, so I made a salad that even the Chinese (who generally do not care for raw veggies) would eat (I eat raw veggies all the time). 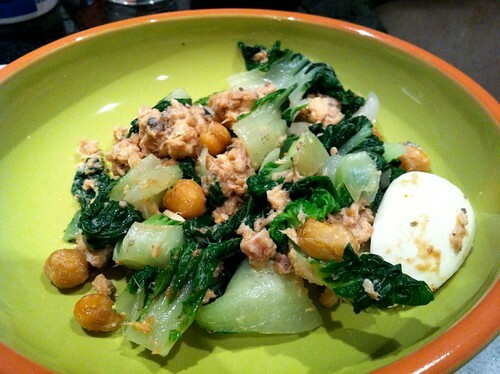 Salmon Bok Choi Salad with Roasted Chickpeas and a Sriracha Ginger Dressing. Heat the oven to 400degF oven. Rinse and drain a can of chickpeas, put on an aluminium foil covered sheet and drizzle some sprinkle with some kosher salt, pepper, cumin and garlic powder and drizzle some Extra Virgin Olive Oil. Toss to coat. Pop into the oven for 15 minutes. Take out and give it a good stir and pop them back in for another 10 minutes, or until they are crispy. Take them out and put them aside to cool down. Meanwhile, clean the bok choi. Trim the bottoms and toss them into a large bowl and fill with cold water until all the bak choi is covered. Let it sit for a few minutes. Then give the them a gentle shake (but not strong enough to churn up the sand that has now settled to the bottom) and take them out and put into a colander. Empty the bowl (and all that sand…depending on where you get the bok choi tips, the amount of sand will vary…just keep in mind, the cheaper the bag, the more sand is proabably in there). Rinse out the bowl and dump the choi back in and cover with water again. Now give them a good plunge into the water and return to the colander. Bring a pot of water and salt to a boil. Blanch for 2 minutes and drain into a colander. 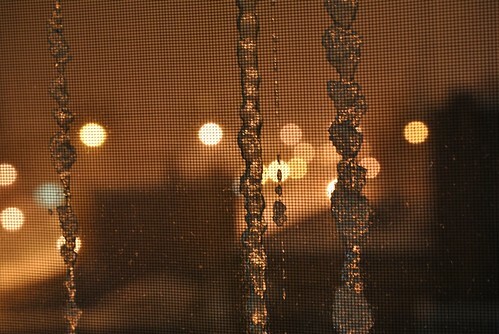 Let it cool. I eyeballed this step, so these amounts are all approximate: In a small bowl, combine a 1/2 teaspoon of sriracha sauce, 1/2 teaspoon of soy sauce, 1/2 teaspoon of freshly grated ginger, a teaspoon of red wine vineger and mix. Then drizzle in about 1/2 teaspoon of seasame oil and stir with vigor. Combine the bak choi (if the pieces are large, you can cut them in half) with the flaked salmon, and drizzle in the dressing. Toss, and on top add the sliced hard boiled egg and a couple of handfuls of roasted chickpeas. Toss once more. 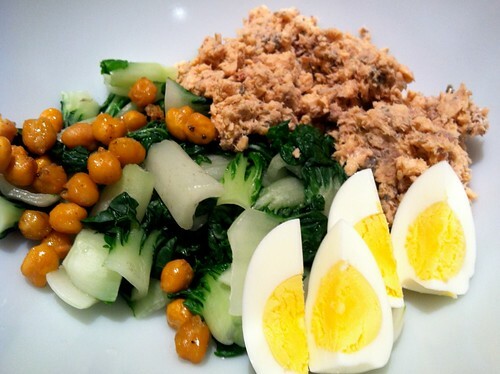 This entry was posted in Dinner, Running, Salad, Uncategorized and tagged Annie's Eats, chickpeas, ginger, Running, Salmon, Sriracha. Bookmark the permalink. Thanks for the inspiring recipe 🙂 Can’t hurt to throw in a little extra protein right?